Have you ever spotted an exotic, international beauty with a run-of-the-mill Joe the Plumber type and wondered, "How did he ever score her?" In the age of Facebook and Twitter, the internet is making the world a lot smaller, especially for finding love. Dating sites such as Match and Eharmony are becoming acceptable means by which Americans find romantic partners. Yet, while some find partners in a twenty-five mile radius, others look for them in a 2,000-mile radius. Try Russia, China and Colombia on for size. The public may remember Natasha Galkina, runner-up of America's Next Top Model Cycle 8. She climbed her way to the top of the pack on the show. All the while, the authenticity of her marital status was questioned. Galkina was born in Russia, but married an American man, Stuart Hagler, 21 years her senior, when she was nearly 20 years old and living in Moscow. They started communicating when she was 18; he visited her in Moscow and continued to pursue her for nearly a year before the pair finally tied the knot in his hometown of Richardson, Texas. For this, she was labeled the Russian mail-order bride. "... 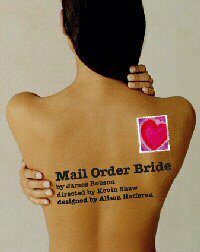 When they said 'mail-order bride' I didn't even know what that was! I had to have someone tell me. And that's not what I am. You know how these men do intercontinental stuff? We dated before I came over to America," said Galkina, in an article in Zimbio.com. Mail-order bride was a term coined in the 19th century during the California Gold Rush. Personal ads for companionship have a rich tradition in America. During the last third of the 19th century, for instance, the San Francisco-based Matrimonial News promoted "honorable matrimonial engagements and true conjugal facilities" for men and women. Mail-order requests for brides became popular because out West, men could prospect for gold but rarely for respectable females. Most women were left back East, so the guys engaged them long-distance, then got hitched. Many lived happily ever after. But as author Chris Enss tells us about frontier teacher Eleanor Berry in the introduction to her book Hearts West: True Stories of Mail-Order Brides on the Frontier: "Her mail-order husband misrepresented himself in his letters and the marriage lasted less than an hour." Now, in the 21st century, the tradition continues and so do people's reservations concerning it. International dating services such as A Foreign Affair have aided thousands of American men in finding partners across the globe. Bud Patterson, Vice President of Domestic Operations at A Foreign Affair, rejects the label of "mail-order bride company" and the stigma that comes with it. His company, instead, is "a respectable International Introduction and Singles Tour company," he says. For an estimated $4,925, American clients can get a full tour to select regions around the world. Once there, clients take part in various "socials" where they meet women in the area. Clients can select the Latin American tour, visiting countries such as Colombia, Costa Rica and Peru, while the Eastern European tour focuses on Russian and Ukrainian cities like Odessa, Nikolaev and Kherson. Patterson claims that the women they introduce to their clients are intelligent and not at all vulnerable. "In the past 16 years, had we at any time developed a reputation for not acting in the best interest of our ladies, we would have gone out of business as there would have been no ladies for our men to meet. Our foreign women are incredibly smart, socially savvy and far too self-respecting to allow any abuses to take place," said Patterson. The question being asked then is: Why don't these women find suitable partners in their own country? In the Former Soviet Union, there are at least 12 million more females than male, according to recent census figures. "If every male in the FSU got married and stayed married - and they don't - there would still be millions of women with no life-partner because there simply are not enough men," said Patterson. "Why shouldn't any of those women - teachers, nurses, real estate agents, engineers and beauticians - have a chance to meet a nice guy from another culture and have the husband and family they so desire?" While some may view the pursuit of a partner abroad as comparable to creating a profile on Match.com, others view the "mail-order bride" practice as a blend of prostitution and slave-trade. The Tahirih Justice Center, a nonprofit organization in Falls Church, Va., that protects immigrant women, views the international match-making industry as a dangerous feeding ground for women. They estimate that the number of mail-order marriages in the U.S. more than doubled between 1999 and 2007, when up to 16,500 such unions were sealed. "While some "brokered" relationships end in happy marriages, others do not, and the abusive situations can be horrific," said Heather M. Heiman, Senior Public Policy Attorney at Tahirih Justice Center. Heiman states that in Tahirih's experience, foreign brides are often particularly vulnerable to abuse and exploitation. They are dependent on their fiancée/husbands for immigration status and are often isolated from a support network of family and friends. In addition, once they arrive in the United States, they may speak little or no English, and they may not know domestic violence is a crime or where to seek help if they are being abused. The dangers in international match-making are noted on the organization's website. Such a case took place in New Je rsey where a 26 year-old Ukrainian engineer named Alla bled to death on the floor of her car after her husband Lester Barney, 58, slashed her throat in front of the couple's 4-year-old son, Daniel. Barney fled with Daniel from the scene, the parking lot of the boy's daycare center, but after an Amber Alert was triggered he turned Daniel over to a friend and was taken into custody by police. Alla had been granted a restraining order against Barney a few months before and had been given temporary custody of Daniel. Patterson explains that while such cases do exist, A Foreign Affair works closely with women to ensure that abuse is not taking place. "Actually we have an excellent reputation among our female clients for running the most classy, appropriate and integrity-driven service of all such agencies," said Patterson. "Women in this process are definitely not forced to do anything they don't want to do. Their participation is entirely voluntary and no intelligent guy would even think of trying to force a foreign fiancée into anything she was not comfortable with or ready for." Furthermore, Patterson explains that they verify the ages of all women who join A Foreign Affair's service and never allow minors to participate. "We are fully compliant with IMBRA (International Marriage Broker Regulation Act of 2006) requirements, which ensures women receive general background information about every guy they meet or correspond with," said Patterson. There is also Fiancée Visa that each client pays for as part of the matching package. This visa process requires an interview with a U.S. Embassy official. "Women are also informed of their future spouses background data and given resources to report any instances of abuse once they enter the US," said Patterson. Meanwhile, organizations such as Tahirih stand guard. Tahirih provides direct legal services for immigrant women and girls fleeing violence in Washington D.C., Virginia, Maryland, and Houston, Texas, and can assist with referrals for other parts of the country. There are NO mail-order-brides. There are NO brokered marriages. Noone made the rule that people from different cultures can't meet, fall in love and live happily ever after for perfectly legitimate reasons. It happens every day all over the world. Don't be ignorant enough to believe that highly intelligent, educated, capable, self-respecting women are "brokered" into any kind of arranged marriage. That's a complete joke. According to the Tahiri Justice Center, AFA "brokers" marriages. How? Seriously, I wouldn't know how to broker a marriage if that were even possible. I've never brokered anything in my life. This is a carefully chosen word by the TJC to give the false impression that women are traded into a cross-cultural marriage. Rubbish! If the TJC actually ever talked to foreign women - most Ukrainian and Russian ladies I know would put them in their place. They know that which is why you never hear them or see them interviewing the same women they are pigeon-holing as desperate, gullible and in danger. Certainly the few isolated instances of abuse in the past are tragic, but not unique to cross-cultural marriage and no less horrific than domestic abuse cases. The idea that the potential for abuse in a cross-cultural marriage is higher and "more horrific" than domestic marriages is unsupported, unsubstantiated, sensational and foolish. People fall in love all over the world every day! Deal with it! It is very dangerous to think of it as being a good institution for both men and women, because I think that it can lead to a new form of trading with mens. However, there might be little room for having good intentions and connect these people together. Still, there remains the question of those who benefit. It often turns out to be a mess for the women to participate in those arrangements because of a certain need, caused by financially and economically urgencies. This is quite a story! Very intriguing and informative. The topic of "mail-order bride" is very new to me but I find it interesting. I don't think this form of arranged marriage is odd, as long as both parties are willing to go through with it and have a genuine love and respect for each other. I wonder, is there a similar program that would allow American women to scout out foreign husbands? Also how do they go about the marriage if perhaps the woman has a different religious beliefs? What are the factors that are considered before they join in holy matrimony?